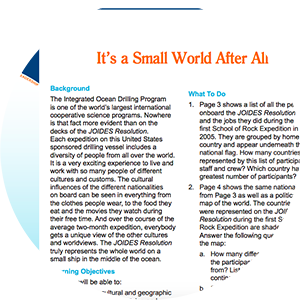 The Integrated Ocean Drilling Program is one of the world’s largest international cooperative science programs. Nowhere is that fact more evident than on the decks of the JOIDES Resolution. Each expedition on this United States sponsored drilling vessel includes a diversity of people from all over the world. It is a very exciting experience to live and work with so many people of different cultures and customs. The cultural influences of the different nationalities on board can be seen in everything from the clothes people wear, to the food they eat and the movies they watch during their free time. And over the course of the average two-month expedition, everybody gets a unique view of the other cultures and worldviews. The JOIDES Resolution truly represents the whole world on a small ship in the middle of the ocean.